To plan a funeral is to choreograph a tribute, farewell, parade of sorts, and memoir all in one event. Many first time funeral attenders find themselves caught off guard. Everyone anticipates a tribute of sorts, so it's the least problematic. The other aspects require more foresight when the time comes to funeral arrangement. For all appearances, the funeral is first and foremost a tribute. There's a solemn service, often a commemorative monument, the breaking of the ground, and an assembly of reverent participants. This is what most people find easiest to prepare for. These are the familiar images of funerals. And thankfully, that's where the biggest choices lie in the preparation process. The first step for planning a funeral is outlining what the service is to look like. It's a way of respecting tradition and of giving a last voice to those values most closely held by the deceased. Religious preferences and perspectives are a serious consideration. The service is often a significant financial consideration as well, as prices of facilities and staff will vary. Also foreseeable is the sense that a funeral is a farewell. Yet, here there are elements less familiar to those having never planned such an event before. 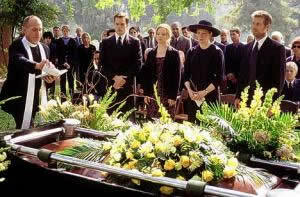 For example, the family must make decisions about whether or not to have a viewing of the deceased. Likewise, families may not anticipate considerations about whether or not to host a reception of some kind afterwards. Some have no qualms with the thought of hiring a caterer, as though the funeral was a respectable last gathering with those friends of the departed. Yet, others see this as an odd juxtaposition. Funerals are not always celebratory. But the hardest choices come with the less familiar aspects of the event. Families will have to think through whether or not to have a procession from the funeral to the gravesite. There may be a procession of special vehicles, a line of passing flags, and a 21-gun-salute in the case of military funerals. The logistics of choosing a route, the order of participants in following it, and degree of formality involved are rarely considered beforehand. Families should also prepare for the challenge of guests sharing memories. Few people are trained in public oration, and people often speak from their hearts. Sometimes people deal with their grief or discomfort by telling jokes. Sometimes they share stories that seem frivolous as they struggle to articulate themselves. Families may want to be prepared to have someone emcee the process, such as a clergy person or funeral home staff person. Some families will request ahead of time that the service be kept light and hopeful, while others will express a desire to share their deepest emotions. Some elements of a funeral will always be surprising, and families can trust that the service is a time for grieving, sharing, and most importantly, being together.